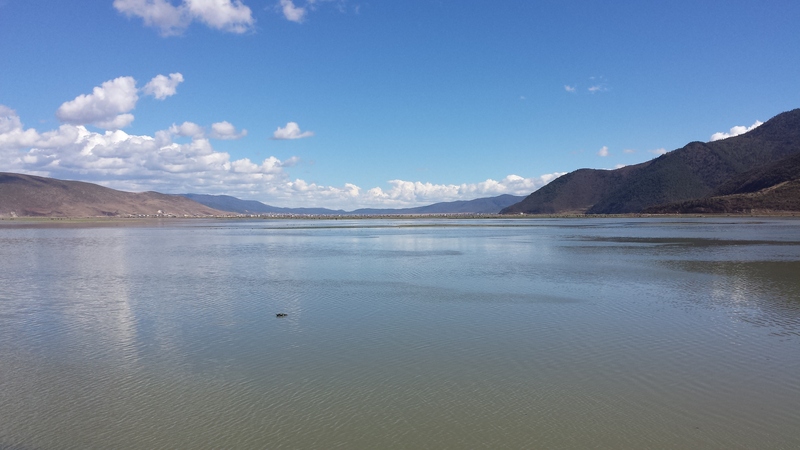 The next morning I took the bus from Dali to Shangri La which is around a 6 hours journey. 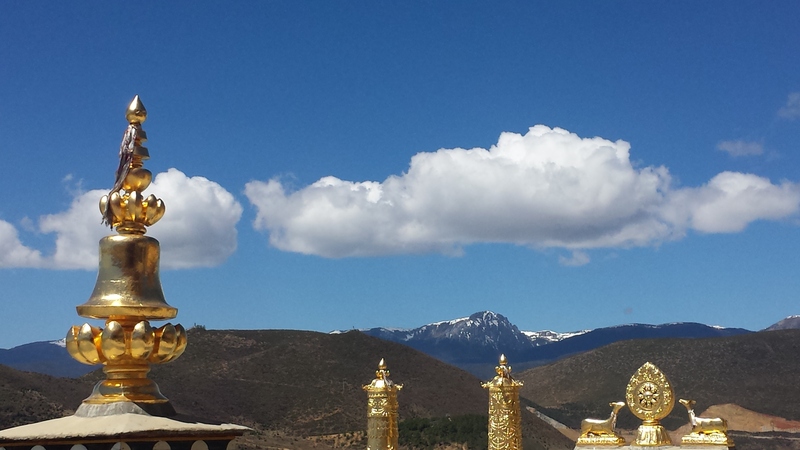 Honestly speaking Shangri La, or overall the Tibetan territory was the main reason why I decided to go to Yunnan. 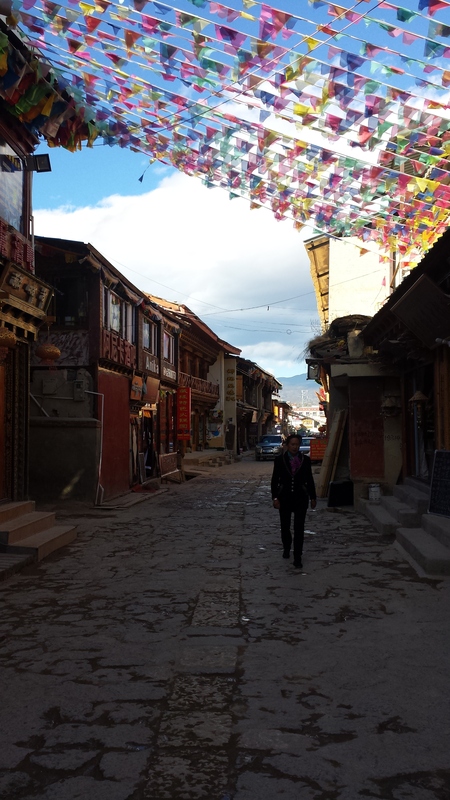 I was SO excited to finally set foot on Tibetan soil again. A taxi, organised by the friendly youth hostel staff, picked me up at around 8am and dropped me off outside a shop which was some sort of travel agency/coffee shop/local hang out spot. After around 10 minutes a bus pulled up and I was told that this would be the bus to Shangri La. I was the only white person on the bus and I was also the only female which obviously got me some attention at first before everyone minded their own business again – thankfully. The 6 hours on the bus were actually really pleasant. 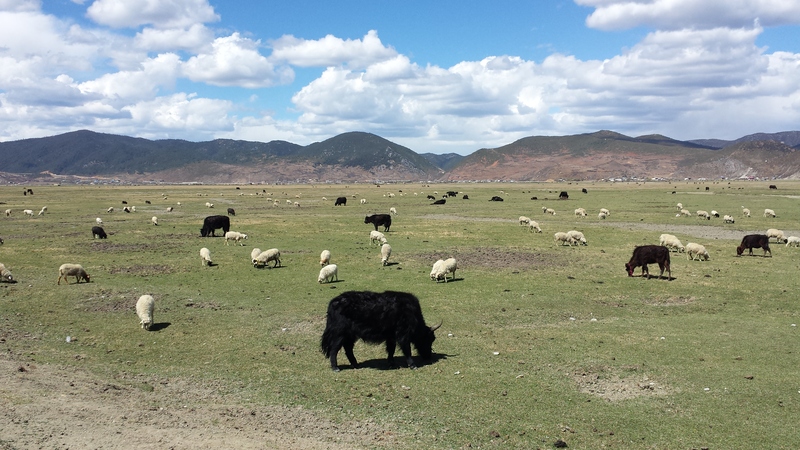 The countryside we drove through was beautiful and I enjoyed listening to some music and munching on some snacks I had bought in Dali. Now, you might ask yourself why this place is called Shangri La. Most of us might have heard of Shangri La, either as it being a hotel chain or having read James Hilton’s book Lost Horizon (1933) where Shangri La is described as an earthly paradise. The Shangri La I am talking about is neither the one nor the other. 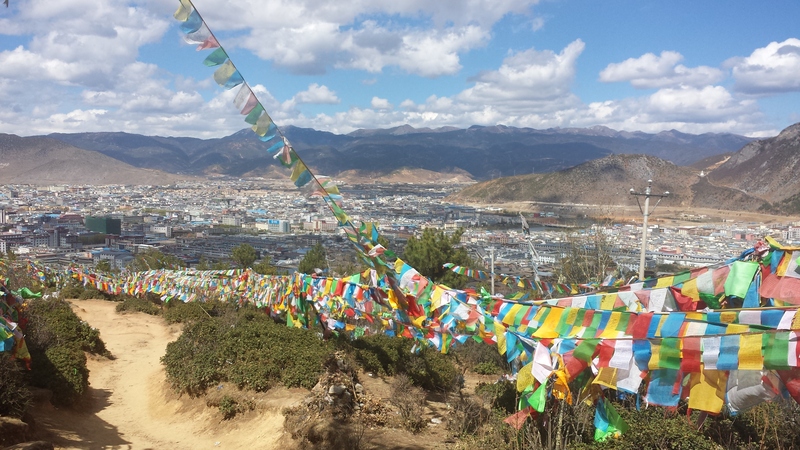 It is a town in Yunnan/China, which is known to the original Tibetan population by its traditional name Gyalthang and to the Chinese population by its name Zhongdian. Only in 2001 it was renamed Shangri La, in an attempt to attract more tourism. Did it work? I say so.. Apparently the number of tourists increased from 20000 before the name change to around 2 million (before the big fire in 2014). How easily the human mind is tricked always astonishes me. In the afternoon we reached our destination. I was told to get off the bus, so I did and made my way to the exit where I was already greeted by a bunch of young locals who were very keen on taking me to my hostel. The hostel had informed me about the taxi price in an email, so it was easy for me to handle the price negotiation. The young boy who agreed to take me seemed to be very proud of the 5 RMB he overcharged me and that got him a lot of cheering from his mates, which I found rather amusing. On the way to the hostel we had a little conversation – as much as my Chinese permitted. 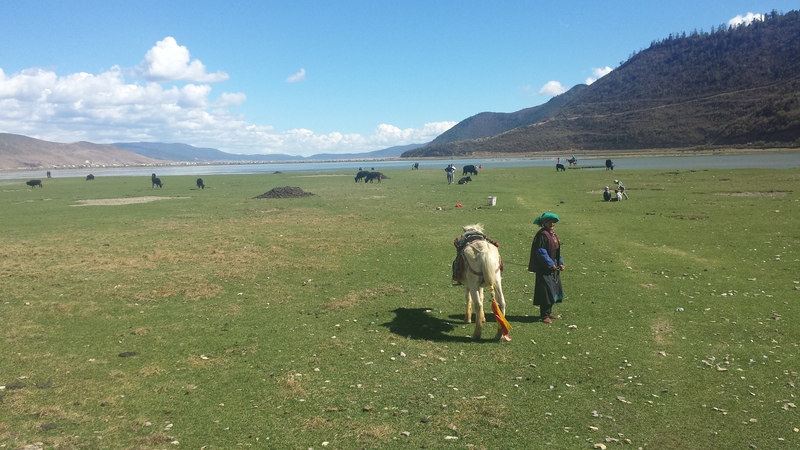 The young man was Tibetan, in his early twenties (he looked like 15) and had a girlfriend. He was shocked to hear that I was in my early 30s and not married. However, after joking around with him that I had several boyfriends and I could not decide which one to marry he kind of warmed up to that idea and I was glad when we arrived at the hostel which ended that conversation. 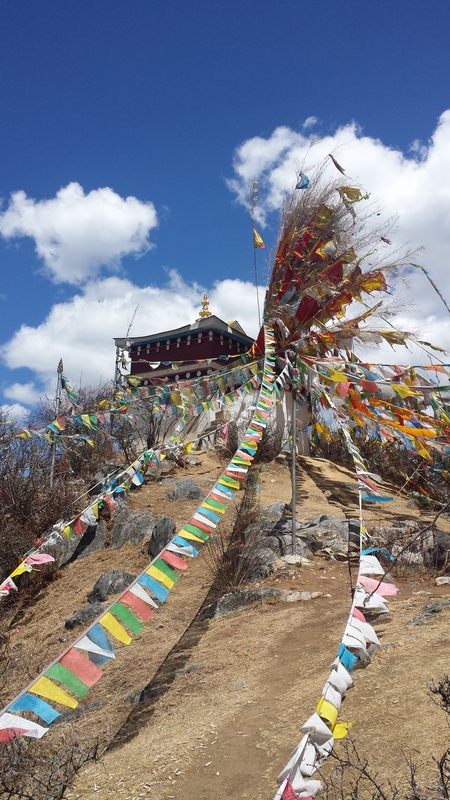 Shangri La lies at around 3200 m and you can feel it. After I checked in my hostel, which was basic but at the same time very cosy, I explored the area. The weather was lovely and the air crisp and clean. 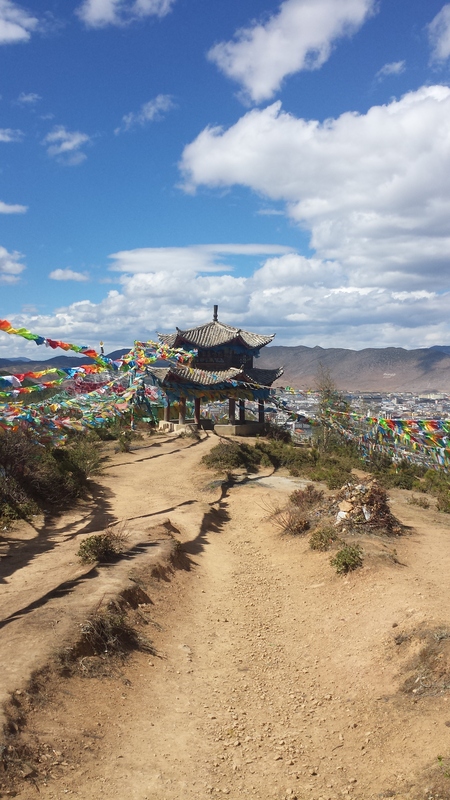 The hostel owner told me that there was a nice temple just next to the hostel called Chicken Temple which also offered a magnificent view over Shangri La. At the Chicken Temple I met a Spanish guy and we decided to spend the afternoon together exploring the city and having some great conversations about life. I did not ask him for his name nor for his Facebook, email, whatsapp or any other sort of social media details. Sometimes it is nice just to spend a few hours with someone, enjoying each others company and conversations and then let go of each other with only the memory remaining. We visited the old town which, as already mentioned, was severely damaged in a fire in January 2014. With most of the houses in the old town being made out of wood the fire spread easily and destroyed around 240 houses. One good thing about the devastating fire – and this comes from a very selfish point now – is that there were hardly any tourists about. 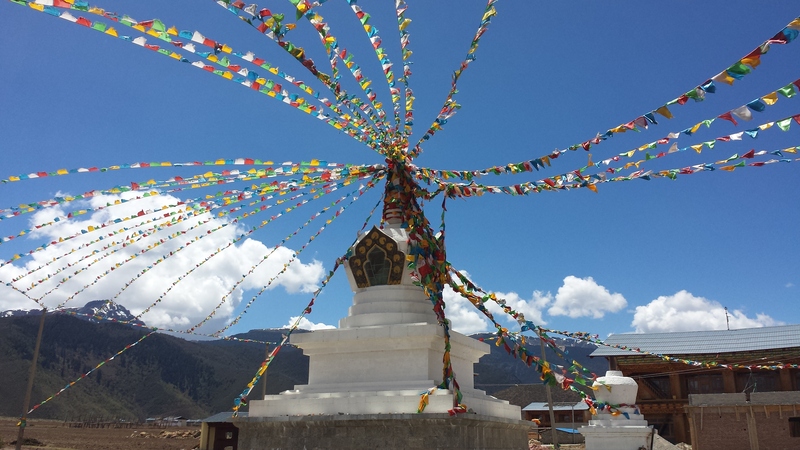 We also visited some of the other interesting sights around the old town, including the 24m tall prayer wheel which in Buddhist tradition people spin to submit their prayers. However, due to the size of this wheel it takes more than one person to actually set the wheel in motion and hence in order to successfully send your prayers you might also need the support of other people. The remaining part of the old town including the market square were just beautiful. 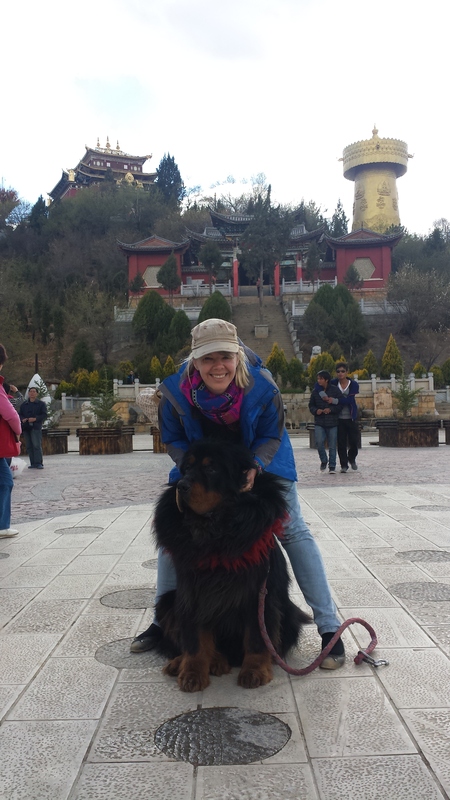 I also fell in love with a Tibetan Mastiff, who besides his looks seemed to be a very gentle soul. 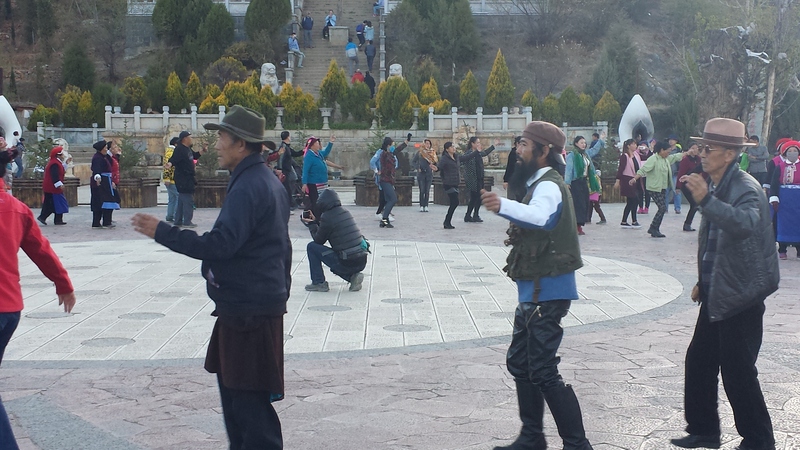 Every evening the local Tibetans organise a dance on the market square and everyone is welcome to join in. Although I did not join in, I did soak up the magical atmosphere of the moment. In the evening I had dinner with the Spaniard and a Japanese guy who joined us in the restaurant. 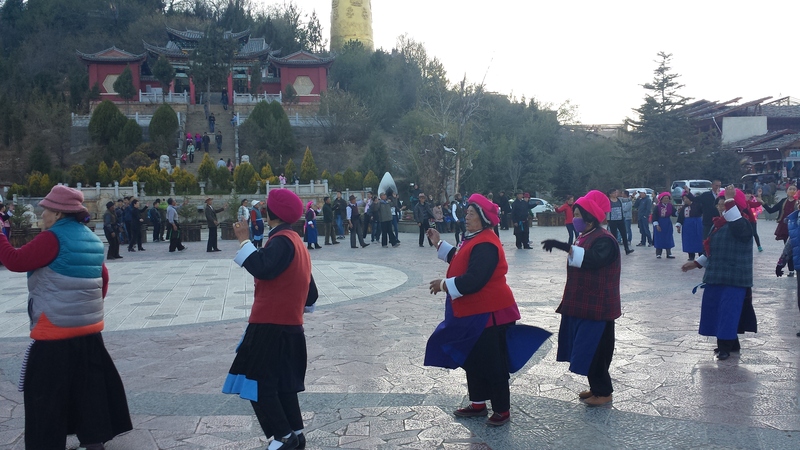 We also enjoyed the company of a Chinese man, dressed in a Mao suit, who seemed to attentively listen to our conversation over hotpot and locally brewed schnapps. Whether he was just interested in the strange laowais’ conversations, practise his English or was actually interested in our stance on some political issues – I am not entirely sure. No one knocked on my door later on, so I guess whatever it was, it was alright. After a good night’s sleep – lucky me I was the only person in the 6 bedded dorm- I woke up full of energy (OK, apart from the slight headache resulting from the schnapps and beer I enjoyed the evening before). After breakfast I rented out a mountain bike from my hostel (another surprisingly great bike), stopped at a local supermarket to buy some sunscreen (due to my limited Chinese my explanation went like this: sun, outside, hot. 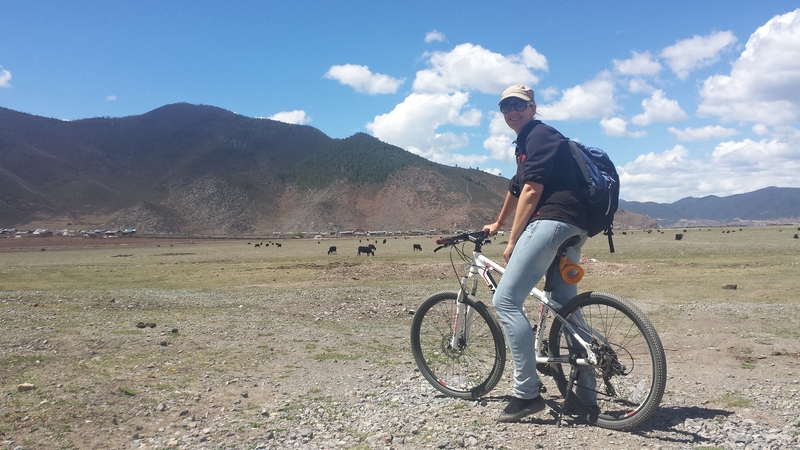 Then I used body language to express pain and cream and yes, it worked) and cycled to the very famous Songzanlin monastery, which is just outside of Shangri La. As it is not possible to go to the monastery directly I left my bike at the ticket office, bought an entrance ticket (around 100 RMB – not cheap) and then hopped on a shuttle bus which drops you off just outside the monastery. Sitting on the bus I felt like a child just before Christmas – my anticipation level was immense. 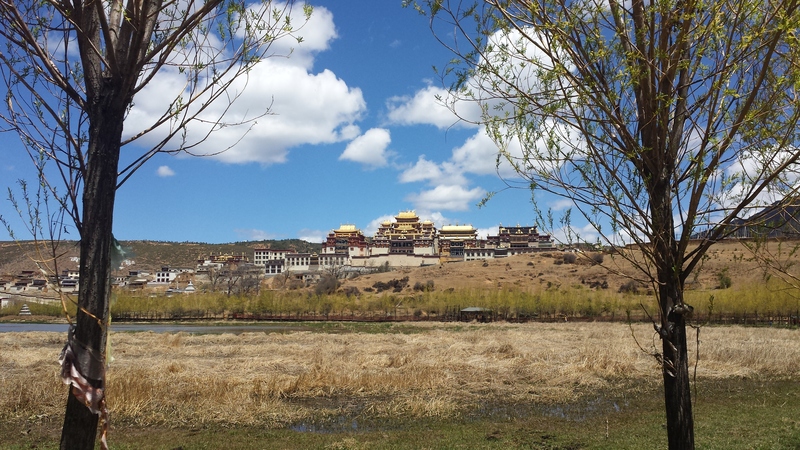 And then there it was: Songzanlin Monastery or in Tibetan Ganden Sumtzeling. 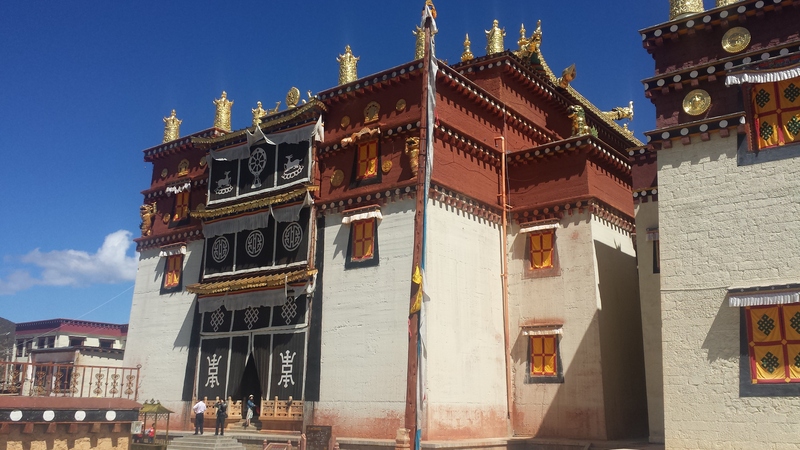 Built by the fifth Dalai Lama in 1679 this is currently the largest Tibetan Buddhist monastery in Yunnan province. 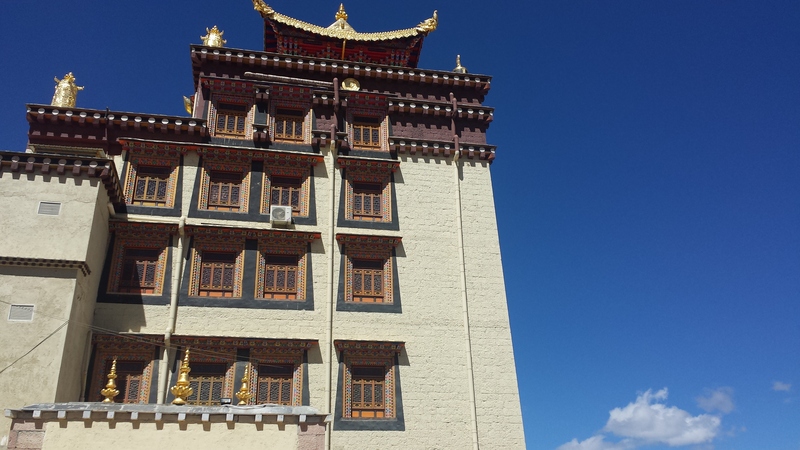 It is sometimes referred to as Little Potala Palace. 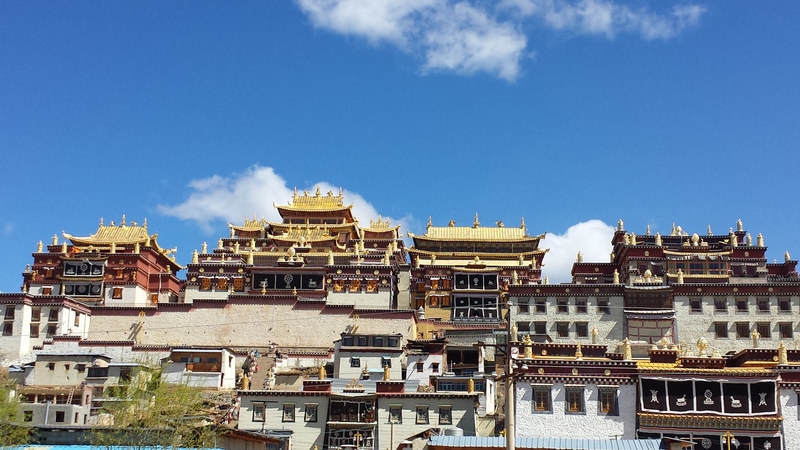 As most Tibetan monasteries it was severely damaged in the Cultural Revolution and later rebuilt in the 1980s. It currently accommodates 700 monks. And it left me awestruck. It belonged to these moments in life when I cannot express how grateful I am to be here on this planet and to live the life I am living. I was wandering about for a couple of hours, enjoying the atmosphere and my own emotions. 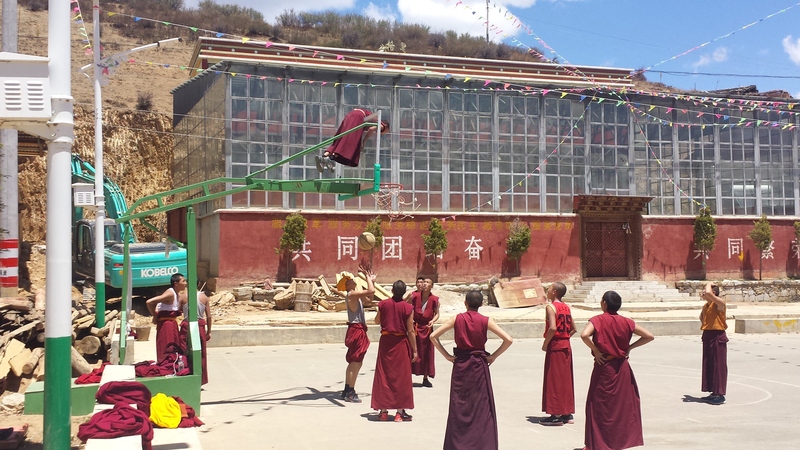 I watched the monks doing their chores, watched the tourist groups come and go and yes just enjoyed my presence. 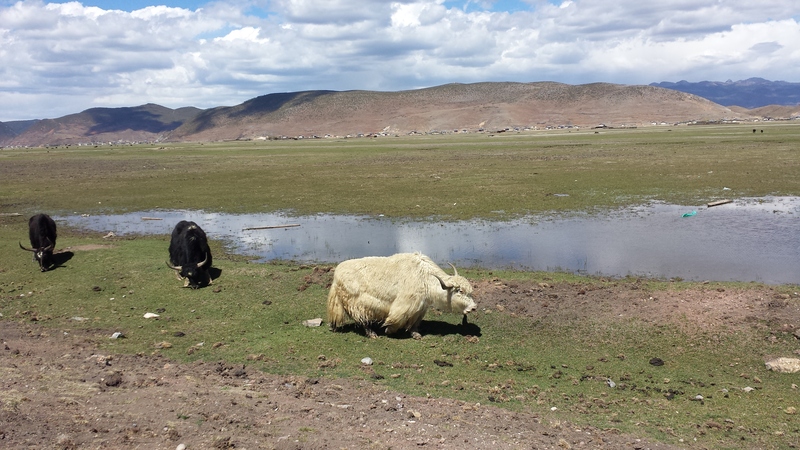 I left the monastery in the early afternoon and as it was still too early to return to the hostel I decided to cycle around the grasslands which were not too far from the city. It was a lovely 3 – 4 hours bike ride and although the thin air made it slightly more challenging I enjoyed it a lot. 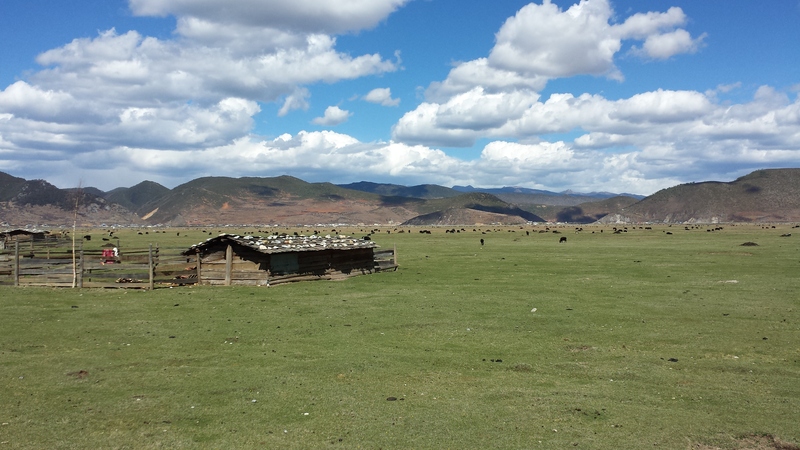 I was surrounded by yaks and horses and the vastness of the area gave me this deep feeling of freedom. I returned to the hostel in the evening, had dinner with my Japanese friend and as I was knackered had a rather early night. The next morning I only had a few hours left before I had to go to the very small airport from where I would catch my flight to Kunming and then back to Beijing. 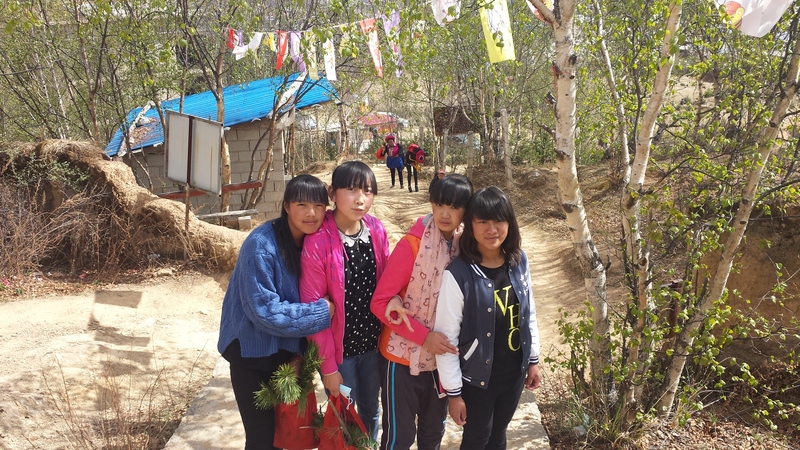 After a lovely breakfast in the hostel I walked up to Chicken Temple one more time where I met some very sweet Tibetan girls who were very keen on practising their English. 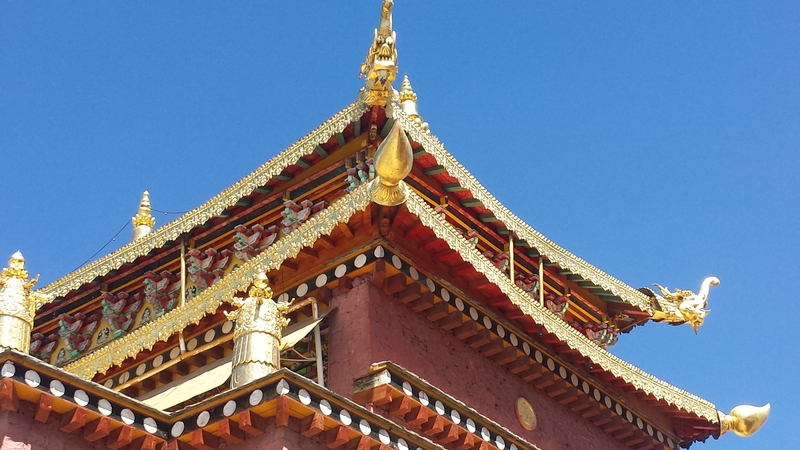 We walked up to the temple together, talked in English and Chinese and shared a giggle. 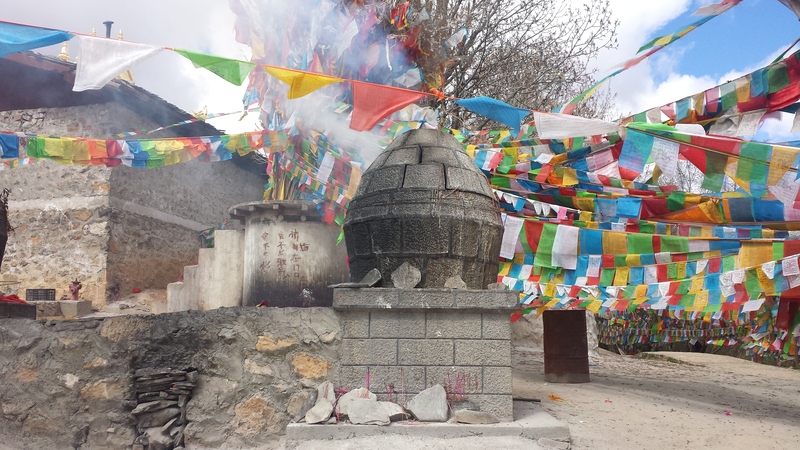 As it was some sort of Buddhist festival that day there were quite a few people up there praying and burning incense sticks. 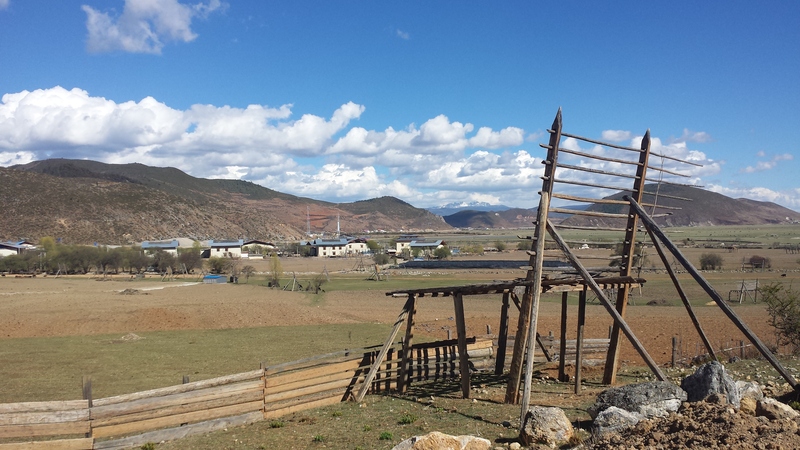 One last time I sucked in the atmosphere, breathed in the crisp Tibetan air and slowly said my goodbyes before heading back to Beijing. Whether it really is Shangri La or not – for me personally I had some wonderful moments and what is life but a series of moments in now! great stuff. thanks for that.